Enjoy the latest issue of Premier Bride Magazine of Northeast Florida! In this issue you will find our “Glamping” inspired décor and fashion shoot! This shoot took place at the Fountain of Youth and over 20 different vendors participated! Click to view the magazine by clicking on “View Book” icon in the scroll bar or on the right side of the page! Visit www.PBJacksonville.com for 1,000’s of wedding vendors and helpful ideas and tip! Great vendors are listed in every category and each category has tips, editorials and timelines to help you with your wedding planning process. Make sure you check out the “Northeast Florida Budget Your Wedding” guide and our wedding planning guide to keep you on track! Don’t forget to submit your wedding for our future publications, the more preferred Premier Bride Magazine and Premier Bride Expo vendors you use increases your chances of having your wedding selected for a feature! 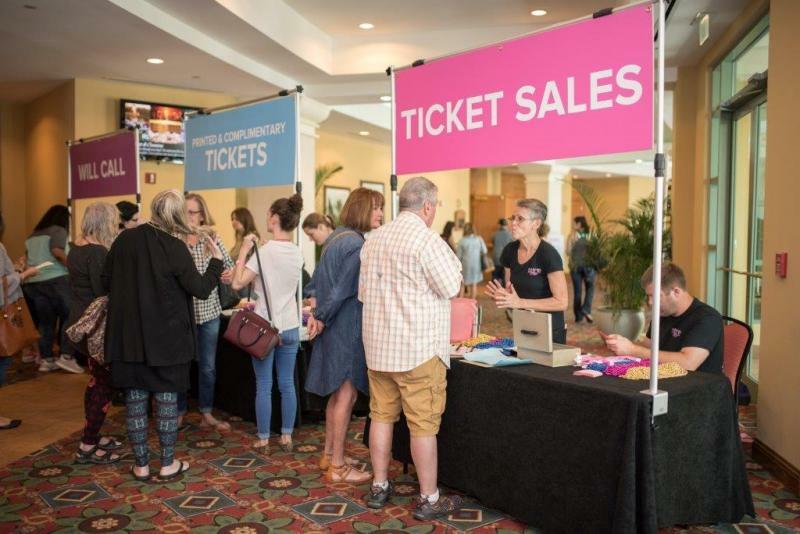 The Premier Bride Expo at the Prime Osborn Convention Center in Jacksonville Florida has grown into Northeast Florida’s largest and best wedding show. 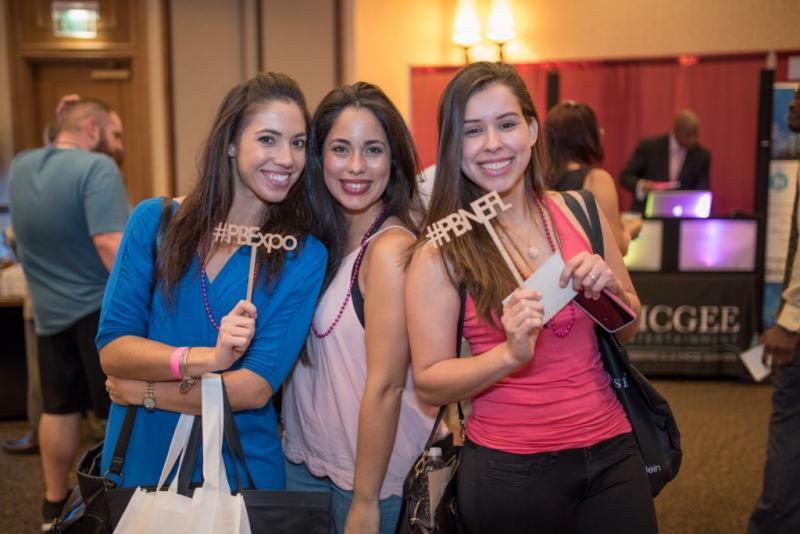 Each expo grows in vendors and brides and grooms participation! We are expecting over 130 of Northeast Florida’s top wedding professionals to exhibit on January 14 2018! 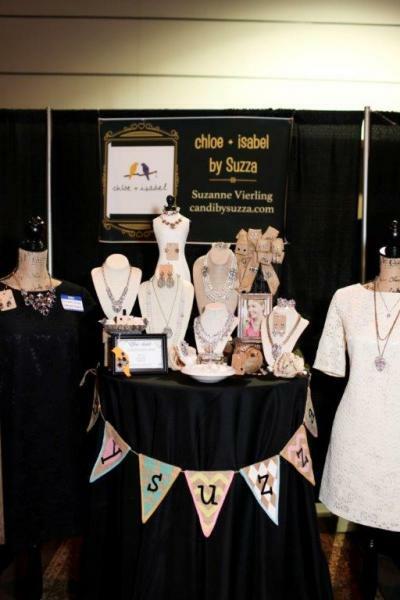 Not only do we have over 20+ categories of vendors but we also have live music, a manikin fashion show, a décor showcase, food, interactive displays, swag bags, and so much more. This expos theme is “Speakeasy” so be prepared to be dazzled with amazing décor inspirations that our wedding planners, décor houses, florists, cake bakers and invitation gurus display! Don’t miss out! Pre-register and purchase your discounted tickets online today! Make sure your print your order confirmation! To keep updated on the latest wedding trends, flow us on social media! Before you come the Premier Bride Expo on Sunday, June 4th at the Prime Osborn Convention Center, check out all these amazing, professional wedding professionals that will be attending the show! Make a list of who you want to see! 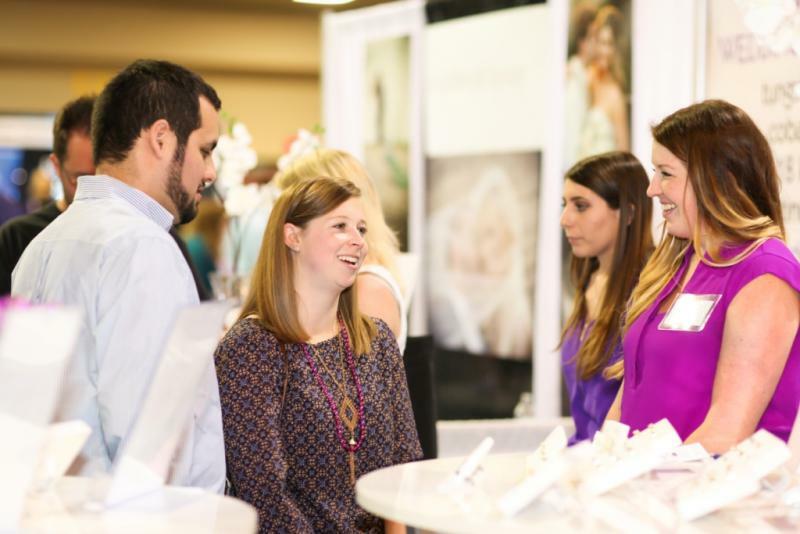 The Premier Bride Expo is Jacksonville’s PREMIER and largest wedding expo! 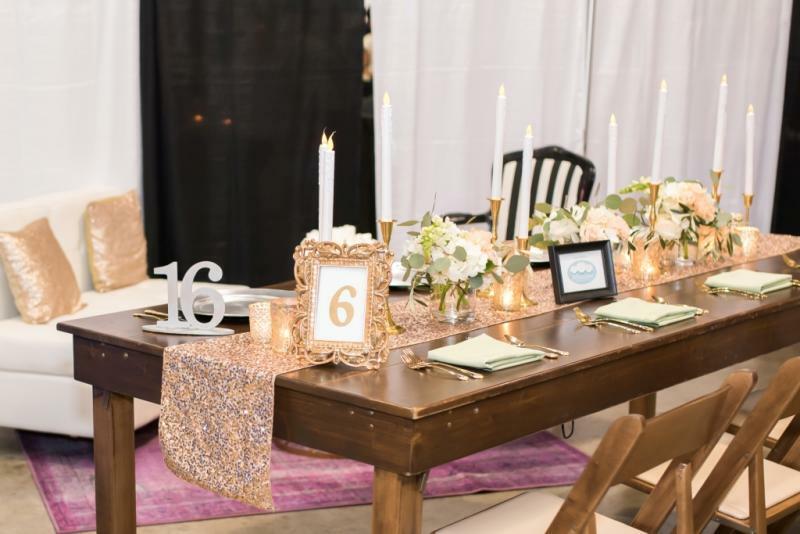 Twice a year, in January and June, the Premier Bride Expo takes over the Prime Osborn Convention Center and turns the plain space into amazing wedding inspirations. Of course, we can’t do it without the amazing wedding vendors who participate year after year. Each year the show grows by vendors, making it over 125+ booth spaces and counting. 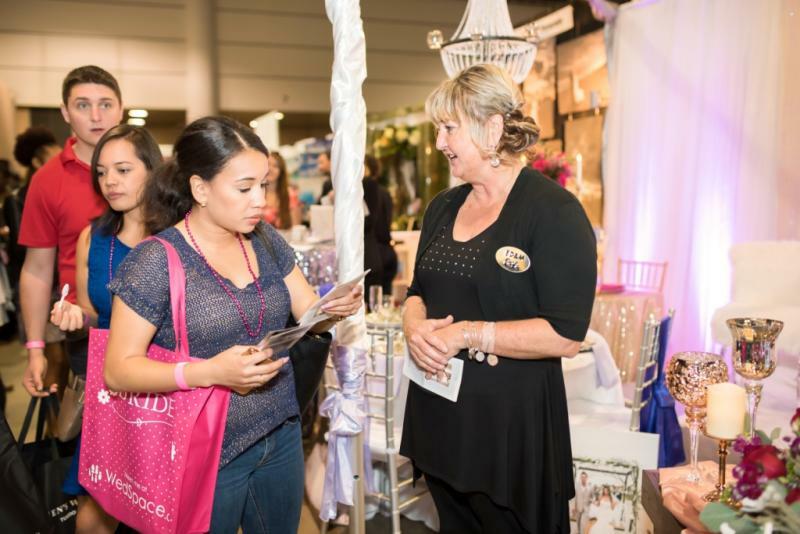 The BEST thing about the Premier Bride Expos is no matter what stage you are in the wedding planning process….there are vendors for you at each show. Lots of thought and consideration goes in to selecting vendors for each show. We make sure that there are choices in styles, prices, locations and options to give each bride and groom that walks thru the door the opportunity to meet vendors that can help make their day special! The theme for this show is “Glamping” – which means glamor camping…..no roughing it allowed! 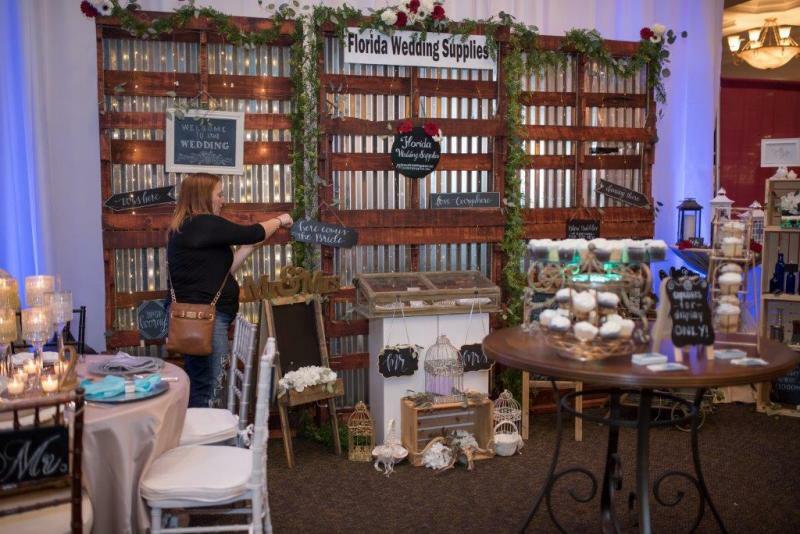 Vendors will create amazing displays thru the décor showcase that gives everyone an incite to their vision on what a “Glamping” wedding would be all about! 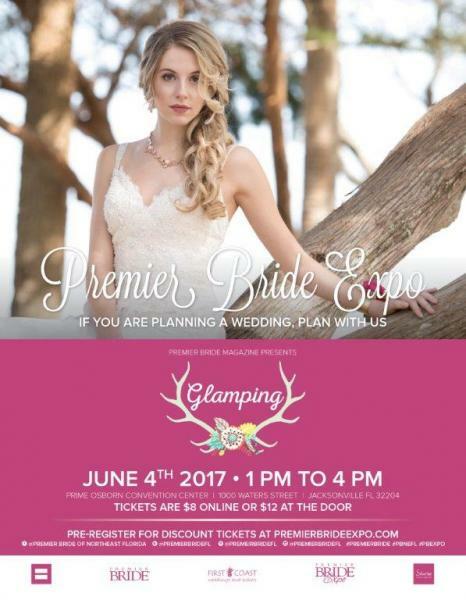 If you are planning a wedding…..don’t miss this expo! There won’t be another opportunity until January so make sure you mark your calendar and get your tickets early. 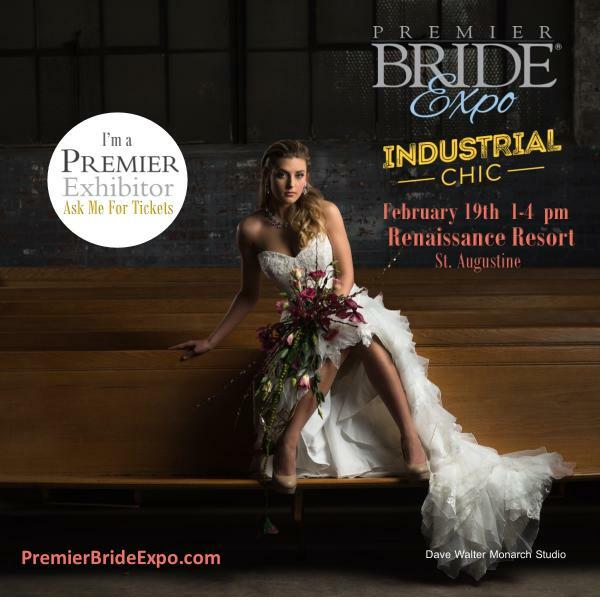 We recommend that everyone pre-registers at www.PremierBrideExpo.com – you can also purchase discounted tickets for $8 or buy them at the door the day of the show for $12. What is a High Top Booth Space? The simple answer is the size. 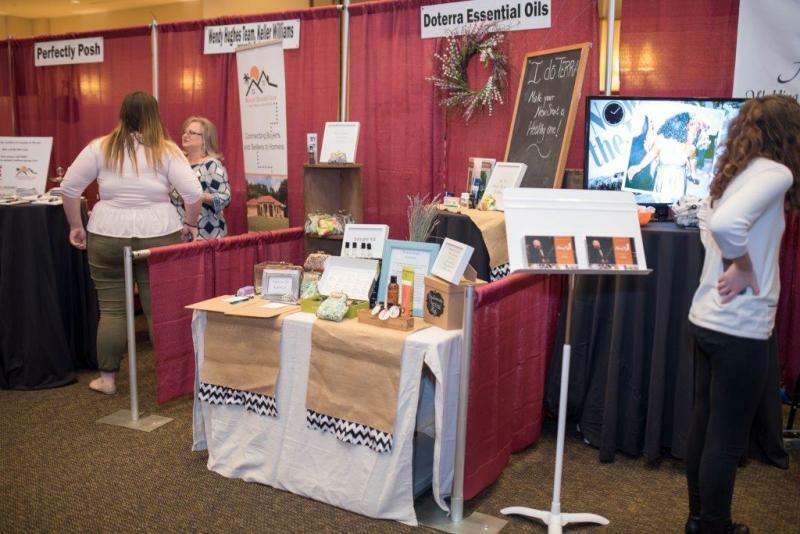 We offer two types of booth spaces at our expos; a Standard Booth and a High Top Booth. Our standard booth is a 10x10 booth space and the High Top is a 5x5 space. 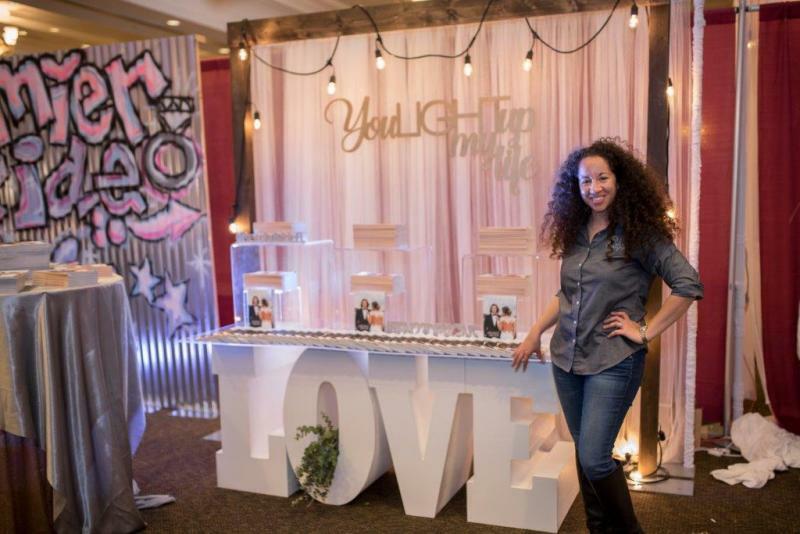 High Top booths spaces are reserved for only certain categories like musicians, wedding officiants, direct marketing companies, or types of business that might not require a lot of space to display but want to meet brides and grooms face to face. The High Top space comes with pipe, drape, a 30 inch round table, linen, a sign for your booth, 1 lunch ticket, bag stuffer, ability to participate in prizes and give-a-ways, leads and online listing! You can bring in additional tables but they must fit within the booth space, nothing can overhang in the aisles! Here are some images of high top booths spaces. 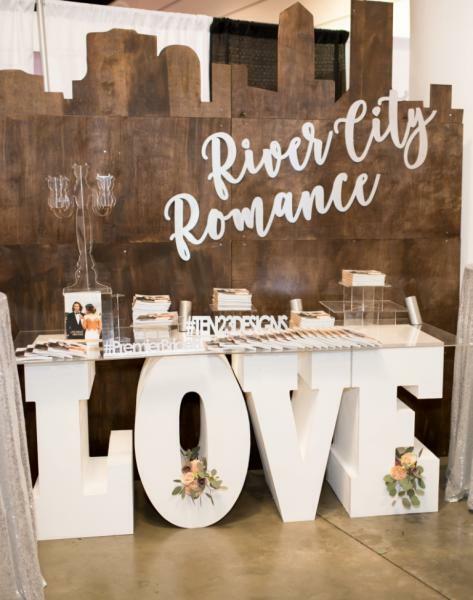 The Premier Bride Expo at the Renaissance Resort at World Golf Village, featured the theme “Industrial Chic.” This theme allowed vendors to get in touch with their industrial side by integrating metals and wood featured in their designs. They loved using bright colors to make their unique pieces pop out and give it a softer, more romantic touch. 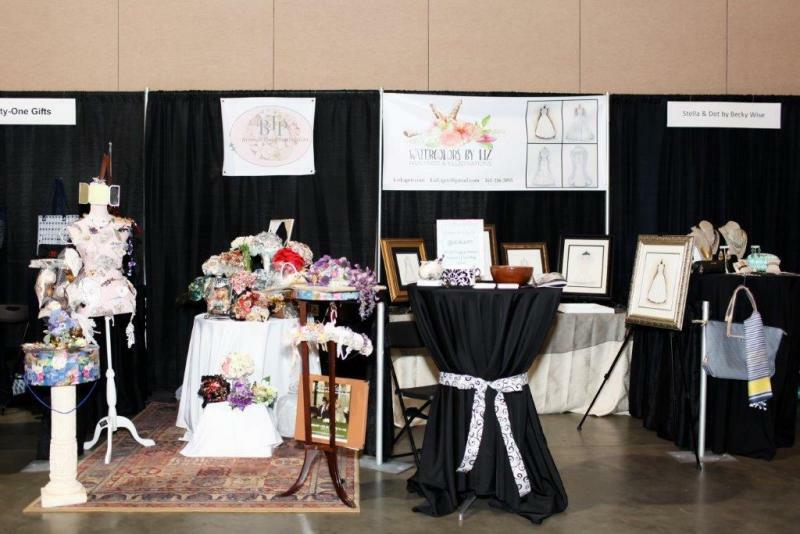 At each Premier Bride Expo, brides, grooms, friends and family members enjoy meeting the area’s top wedding vendors. As you walk thru rows and rows of vendors you will get treated to sweets, savory food, beautiful dresses, and so many inspirations! Bring your camera, take photos and follow up with the vendors you met to be part of your day. As with all of our expos, we suggest you invite all of the decision makers for the wedding! So if that means your fiancé , mom, and maid of honor…bring them! We also suggest that you don’t over invite….with so many people to meet and talk to, trying to manage a large group can get over whelming. Make sure you that you follow us on social media for more ideas and to learn about the vendors who participate in the expos. Our Twitter, Pinterest, and Instagram handle is @PremierBrideFL and Facebook is Premier Bride of Northeast Florida. Brides, grooms, friends and family, here is a list of the vendors that will be exhibiting at the Premier Bride Expo this coming Sunday at the Renaissance Resort at World Golf Village! 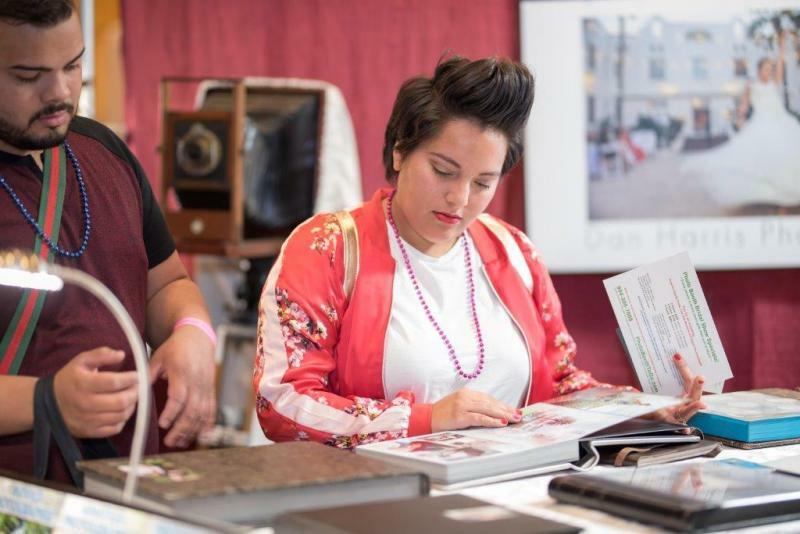 Make sure you make a list of the vendors that you would like to specifically speak with at the show. With well over 100 vendors, it’s hard to talk to them all so plan well! We also suggest that you make your mailing labels with your name, wedding date, address and contact information. This helps save you time when filling out forms or give-a-way tickets! There will be lots of sweets to taste, food to try, music to listen to, fashion to see and amazing décor inspirations! Don’t forget to pre-register and/or buy your tickets online. They are $8 online or $12 at the door. Make sure you PRINT OUT your tickets and registration for fastest entry to the show! Planning a wedding? Don’t miss the last big wedding expo of the year! Sunday, February 19th from 1-4 pm the Premier Bride Expo will be at the Renaissance Resort at World Golf Village in St. Augustine Florida! This show is for brides and grooms at ANY stage of their planning process. What makes the Premier Bride Expo different from other wedding shows is the variety and quality of wedding vendors. We believe that you must have a wide variety of different vendors, from different areas of town, in different price categories at each show. This ensures that EVERY bride and groom can meet and find wedding vendors for their big day. 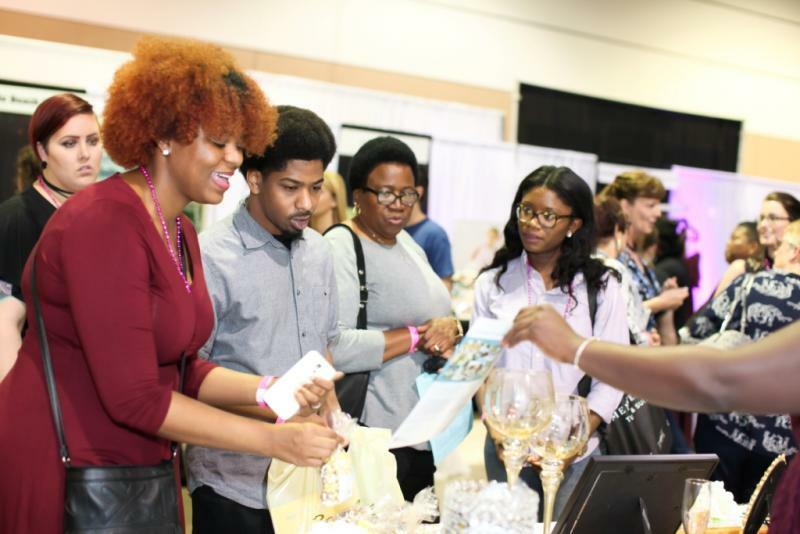 The Premier Bride Expo also has vendors at the expo that might not be directly related to weddings, but has everything to do with married life and decisions you make as a newly married couple. We have 4 shows per year in Northeast Florida. Two at the Prime Osborn and two at the Renaissance Resort, however, we have DIFFERENT wedding vendors at each show. So if you have attended a show before you will see other different and unique wedding vendors at the next show, in addition to ones you might have seen before. 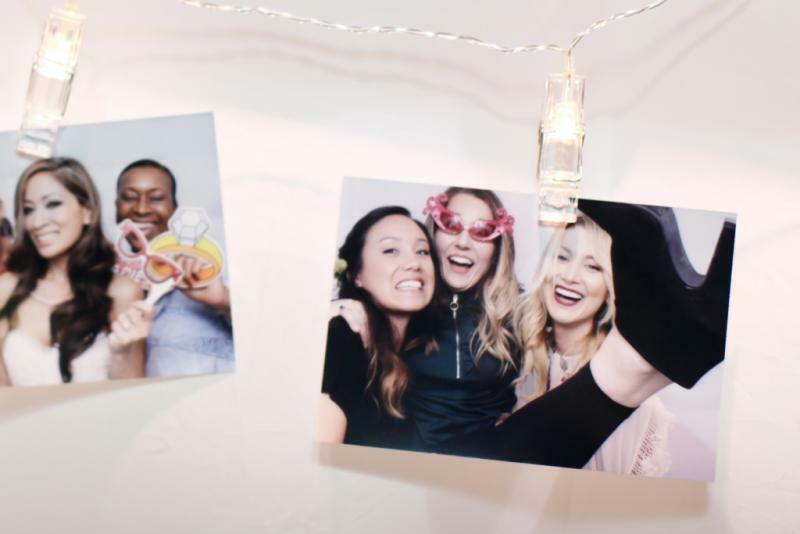 Premier Bride Expos are unique because everyone is treated as a VIP, we don’t have games or scavenger hunts to win prizes, and we create a fun, no pressure environment for couples, friends and family to ENJOY the wedding planning process. The doors are open from 1-4 pm but you don’t have to get there early or stay the entire time. We wristband everyone who comes in so you can come and go as you please! Tickets are $8 online, $12 at the door or contact a local wedding professional for a complimentary ticket! 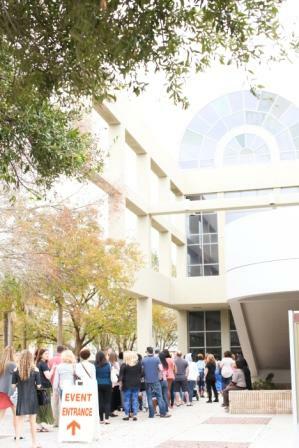 The Premier Bride Expo on January 15th at the Prime Osborn Convention Center in Jacksonville Florida was massive this year…..over 700 brides/grooms attended + their friends and families attended. 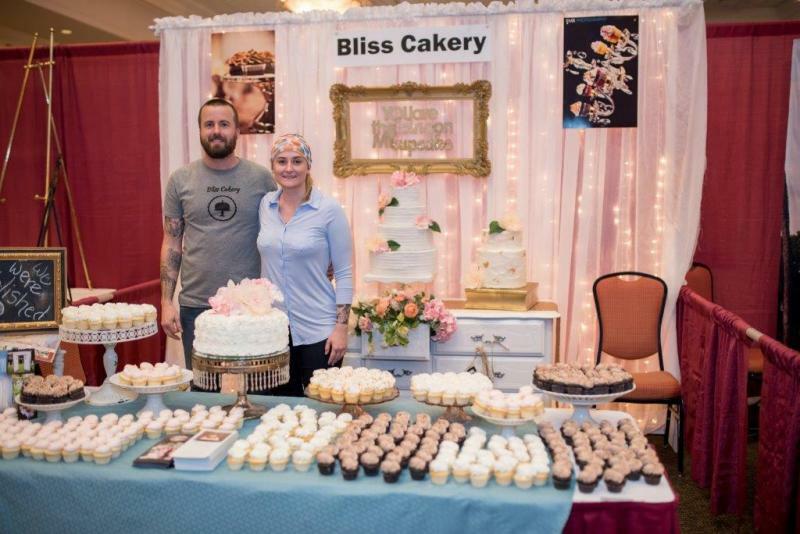 We had over 120 different wedding vendors displaying their goods and services. The winter wedding expos are exciting because so many couples are newly engaged and they are excited to start their wedding planning process. 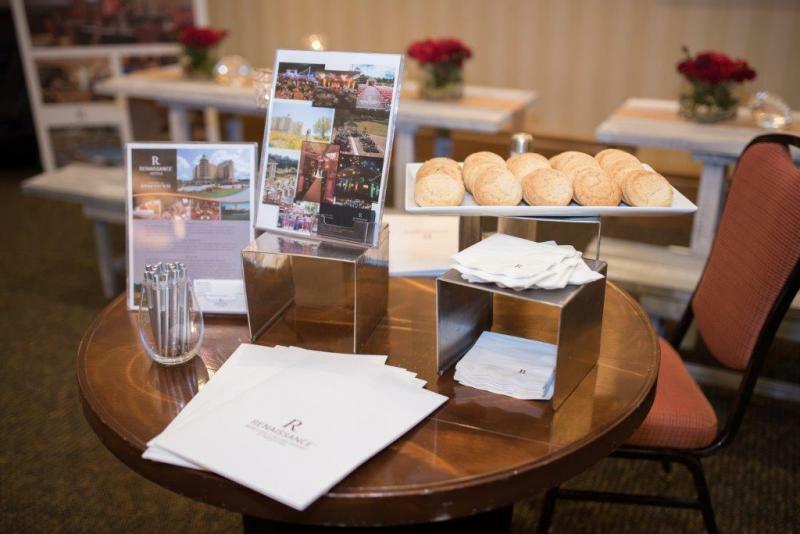 Many couples are eager to meet the wedding vendors and learn about what they have to offer. For many couples, this is the first time they are planning a big event and it can be a little overwhelming but when you talk to true wedding professionals – your worries can be put at ease! Here are some of the images from the show! Make sure you check out our Facebook page @Premier Bride of Northeast Florida to view the entire album! 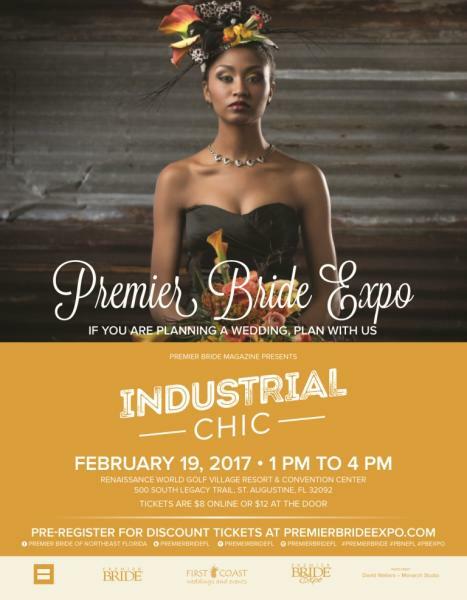 Brides, grooms, friends and family, we are excited to have you at the Premier Bride Expo on Sunday, January 15th 2017 at the Prime Osborn Convention Center located at 1000 Waters Street in Jacksonville Florida. Below is a list of participating vendors, their booth location and the category they represent. Please make a list of the specific vendors or types of vendors you want to meet when you attend the show. Programs and maps will also be handed out when you go through the registration line. Doors open at 1 pm to 4 pm. We have many prizes and give-a-ways to be won. The grand prize, a honeymoon/trip will be drawn at 3:45 pm at the Footloose Entertainment booth. You must be present to win this prize, no exceptions. However, other prizes do not require your presence to win upon drawing. Don’t forget to make mailing labels with; Name, address, phone, email and wedding date! We are looking forward to see you on Sunday!